Records for Smyly’s homes (including emigration records) are physically held at the Representative Church Body Library in Dublin. However, access is restricted to staff of the Smyly Trust to whom initial enquiries should be directed at 15 Rock Hill, Blackrock, Co. Dublin, Ireland (+353 1 283 2071, info@smylytrust.ie). Mrs. Smyly (nee Ellen Franks) was born on 14th November 1815 in Dublin Ireland which coincidentally was the birth place of another famous person, Dr. Barnardo some 30 years later. It is believed that Mrs. Smyly was to heavily influence Dr. Barnardo in later years when he started on his chosen path to help impoverished children. At the age of 19 she married a Dublin surgeon Josiah Smyly F.R.C.S.I. (1803-1864) and they had two daughters Annie Dallas Smyly (1855-1933) and Ellen Smyly (1846-1912) and three sons who all followed their father’s footsteps and became Doctors or Surgeons. Appalled by the numerous starving children on the streets of Dublin in the early 1850s, she performed charity work with the intention of helping to feed them. In 1852 she set up her first Bible school for children. Her efforts were successful and by the early 1860s through tireless fundraising several buildings were secured to house and educate many of these street children. All of the facilities were for boys and/or girls but in 1859 she established a home for infants that she named the “Birds Nest” in Dun Loaghaire. By the 1870s she was estimated to have over 1,000 children in the care of her homes that were collectively known as The Smyly Mission Homes and Ragged Schools of Dublin. Mrs. Smyly was strongly driven by her religious beliefs and she firmly believed that education was the key to defeating poverty in most cases. By the early 1870s the first purpose built facility was completed. With her group of dedicated volunteers, Ellen Smyly endeavored to help needy children in several Homes in Dublin. Mrs. Smyly and least one of Mrs. Smyly’s daughters, Annie and Ellen were on the board of governors of each school. A small magazine titled “Erin’s Hope” was published on a regular basis to help keep in touch with the children. By the end of the 1800s it was estimated that there were in excess of 1500 children being looked after by Mrs. Smyly’s Homes at any one time. Funds to run the Homes were entirely derived from donations from the family and friends of Mrs. Smyly and a growing band of supporters in the community. The backgrounds of the children were many and varied, often being described as destitute. In many cases there was a widow, widower, deserted wife or husband, left with numerous children and no one to look after them while they sought work. At that time there was no state welfare system in place. The children were usually referred through contacts, often clergy, and were admitted by a parent or relative or occasionally a guardian where the children were orphaned. Children were sent to Canada from the Dublin Smyly homes with the Annie Macpherson organisation as early as 1870 to the home in Belleville and later the new home in Hespeler. After the First World War, the children were sent via the Fegan Homes to the site of the new home that was acquired after the war in Stratford Ontario. Mrs. Smyly died in May 1901 and the responsibility and management of the homes was passed to the two daughters and they vigorously carried on with their mother’s devoted passion. In 1905 the two daughters visited Canada and established The Coombe Home named after a similar facility in Dublin. The Coombe was opened at 152, Guelph Avenue, Hespeler, Ontario. Originally built by James Hespeler the founder of the town in 1858. Children were sent from Ireland and stayed at The Coombe Home for a while before being placed on farms or in other forms of employment. They were formally educated, learnt life skills and were taught Canadian history. The Coombe was sold to the government of Ontario in 1917 when it was deemed too dangerous to transport children across the Atlantic during World War 1. Some of the more than 266 children who had gone to The Coombe in Hespeler before that time returned to Europe as members of the military. The Smyly’s kept track of these recruits and have lists of their “boys” who joined up, their units, injuries, or fatalities during the war. The Coombe still stands but is now a block of apartments in Cambridge. 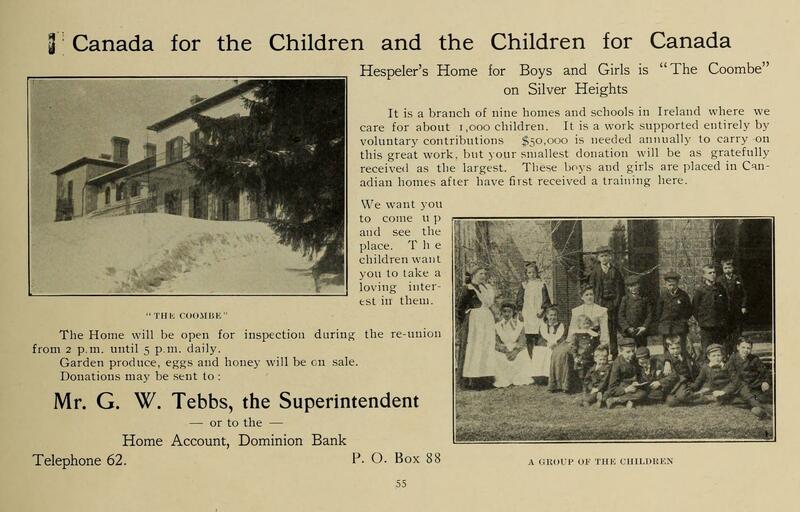 After the war children were again sent to Canada with the Fegan Homes organisation to a home in Stratford Ontario. This home still exists and at 51 Avon Street and outside is a plaque that makes note of the significance of the home and the fact that it is a provincially and nationally protected property. The practice of sending children to Canada was gradually ended in the latter half of the 1930s due to the lack of employment opportunities caused by the economic recession at that time. The organisation continued to care for large numbers of children through the early 1900s when Ireland was still a very poor country with high levels of unemployment. Some parents were forced to leave the country to seek employment and temporarily put their children in the Homes until they got settled in a new country. The Second World War created its own difficulties and there was still a large demand for services for children in Ireland. There was always an emphasis on education within the Homes, as it was believed that this was the only way to progress in the world. Today the organisation is known as Smyly Trust Services and offer a fully professional service to children in need of care in Ireland. There have been changes, but the focus remains the same. Just as Ellen Smyly saw the needs of children so many years ago, the organisation strives to identify and meet those needs in the context of the world we live in today.